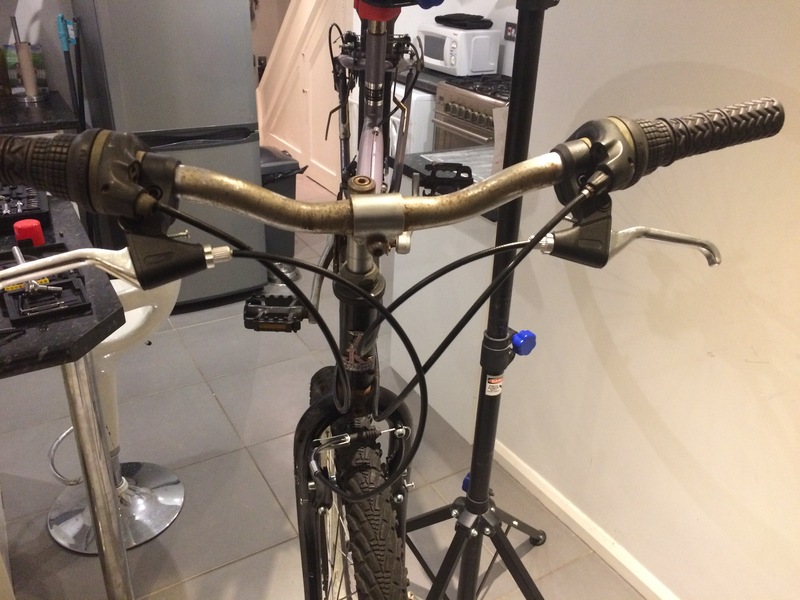 Raleigh Wildcat – one step closer..
Serviced the pedals last night. They are solidly seized to the cranks, and didn’t have time to try freeing them, so removed the pedals from the in-situ spindles. Gave everything a thorough clean, and replaced the bearings (happened to have some size matched bearings, originally purchased for the Fire Mountain headset, in my parts box), giving a liberal coating of grease. One of the pedals is absolutely perfect in terms of friction-free and play-free movement; the first one I did has a mm or two too much play, so I’ll be tweaking that tonight. They were both incredibly graunchy prior to this, so a big difference. Also chopped off the stubs of the pannier screw with a pound shop special junior hacksaw.. it’s pretty flush with the frame but needs a check for sharp edges. I have a new chain and gear cables on order; the cables being Muddy Fox from Sports Direct. These are £1.50 for inners and outers, so I bought four sets, leaving two left over as spares once those on the Wildcat are sorted. 13.8m, 16 Strava trophies including five PBs, 52 minutes, boom. Saving the off roading for Sunday. My mate J has recently bought a bike, along with a matching ladies version for his other half. They’ve done several flat rides, but not ridden on the Downs yet. So J and I planned an introductory off-road ride, going from Shoreham to Devils Dyke and back. The route was identical to my last ride.. up Mill Hill and then Truleigh Hill, and over to the Dyke. We had a short rest, and then came back, choosing to ride down to the Adur across the field and then down the singletrack, down to the Downs Link Trail. From the Amsterdam / Red Lion, we parted company, J going home, and me still massively sitting on the fence as to where I’d go next. I started riding east, towards Brighton, as I’d wanted to get to a Stamner for more Singletrack. I was on a bit of a tight schedule by this point, but decided to push on by road, which made it feasible time wise.. off road to the Beacon would definitely not have been doable. Headed to Hove Park, then up Woodland Drive. Down past Withdean Stadium and along to Carden Avenue. Up Carden to the top, and across a field, accessible from the roundabout, diagonally, on to the Beacon Road. It was further than I remembered to get to the entrance to the woods from this end, but to be fair, I’d never ridden from this end with the specific intention of riding Stamner. Got to the entrance and had a stop for a Go Gel and to have a long swig from my Camelback.. I’d ridden 25 miles up to this point, and was concerned that slight fatigue would take the edge off of my reaction times, so didn’t want to distract myself with a camelback as I rode through the swoopy Singletrack. Took pretty much the same route through as last week, not really having time to explore, but had great fun doing so, feeling just as exhilarated coming out the other side as last week. Rode down to the next section, where there was a notice indicating that there’d been a council-sanctioned bike event here earlier, and rode the rest of the Singletrack down to the Uni / Stamner Park fields. From here it was an identical last leg to last week.. straight down Lewes Road to Brighton seafront, and back along to Shoreham, totalling 40.7 miles. It was great to note how much cleaner the bike was at the end of the ride.. it only took half an hour to get her spotless, a sure sign of the ground drying up. I even had time to get her up in the stand and index the gears, as I’d been experiencing a frustrating amount of chain skipping throughout the latter part of the ride. So, 55 miles in total this weekend, and 80 in total this week! I didn’t get to work on the Wildcat on Sunday as the Stamner Ride and subsequent bike cleaning took longer than expected. Remove the struts for the panniers – these are about four inches long, and have the stuck screw problem that I’ve experienced all over the bike, despite a liberal soaking with GT85. The cost of tools I’ve purchased in the course of this aren’t included, since I’ll be using those hopefully for many years to come.